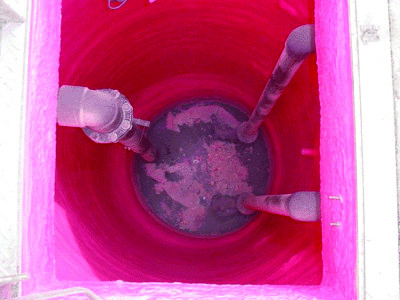 Problem: The protective coating was failing on two leachate collection manholes at an Ontario landfill, resulting in severe corrosion of the concrete and costly treatments of groundwater. Solution: City officials hired Liqui-Force Services to rehabilitate the structures. After extensive safety preparation, workers used high-pressure water blasting to expose a solid substrate, then installed a stress skin panel from SpectraShield to eliminate corrosion and stop infiltration. Result: Repairs to both structures were completed in less than one week.